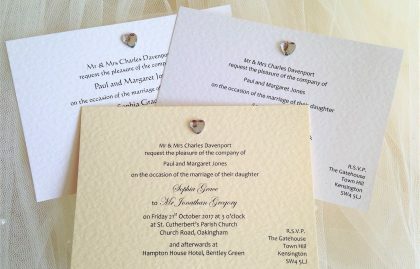 Wedding invitations from 60p each supplied with free envelopes and free guest name printing. Invitations are supplied fully assembled. 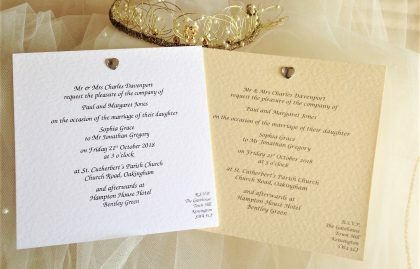 Daisy Chain Invites are able to offer quick delivery as all our wedding invitations are printed in the UK. 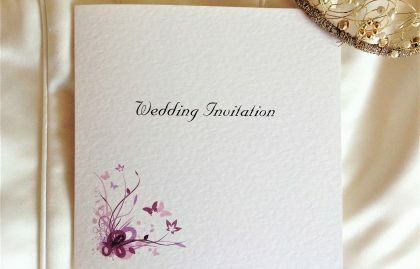 We have an invitation card for every budget. 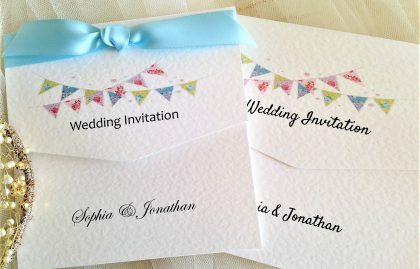 If you have small budget take a look at our cheapest wedding invitations, priced at less than £1 each. 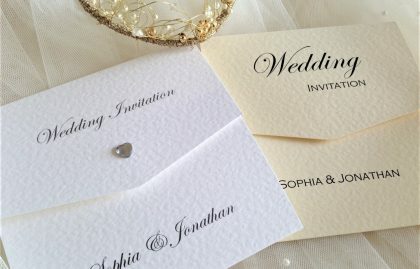 Order today our fabulous affordable wedding invites, fully personalised with free envelopes. We can print whatever you wish and include additional information. If you need help with your wording don’t worry. 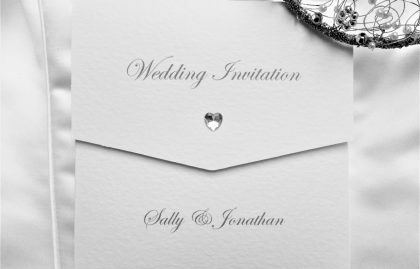 We have lots of experience and will compose your invitations for you, from the details you provide (no extra charge for this). 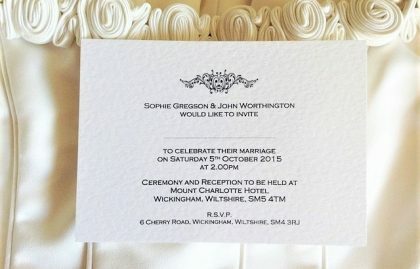 There are some examples of wording on our website which may help you compose your invitations. 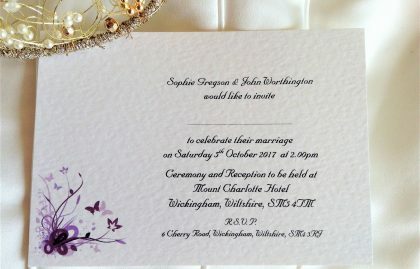 We are able to produce wedding invites in other languages. 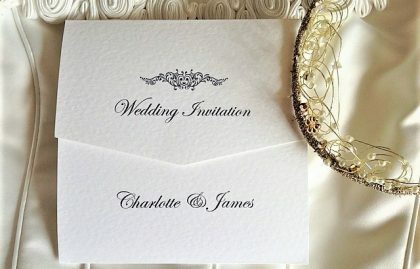 Please contact us to discussbilingual wedding invitations, some of our typeface styles are limited to particular languages. We have short lead times, all our printing is done in house. 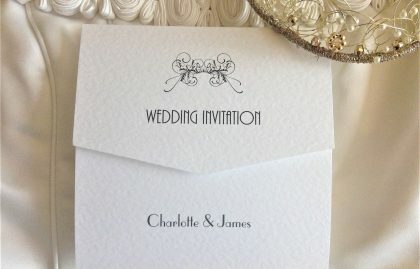 Invitations and matching wedding stationery can be ordered and supplied within a short timescale, usually 3-4 days for quick delivery in the UK. Once payment has been made layouts of items ordered will be emailed to you for approval prior to printing. Please check them carefully. Check out our testimonials on Trustpilot and Freeindex and order with confidence. 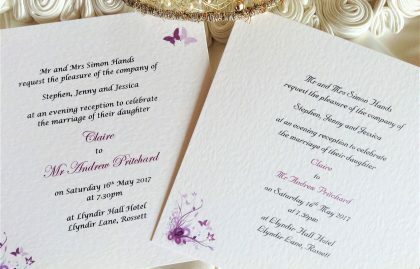 Daisy Chain Invites are a small UK printing business who have over 12 years of experience in producing affordable wedding invitations for all styles of wedding ceremony without compromising on quality and style. 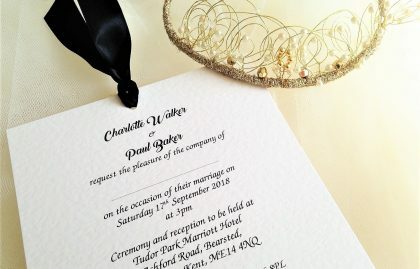 Whether you’re having an intimate wedding with just your nearest and dearest, or an expansive celebration with hundreds of guests, we can supply personalised wedding invites handmade for you. 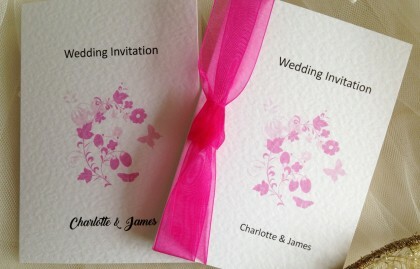 The majority of our invitations have matching stationery items, so everything will match beautifully on the day. If you’ve left things a little late, don’t worry, we offer short lead times and fast delivery. 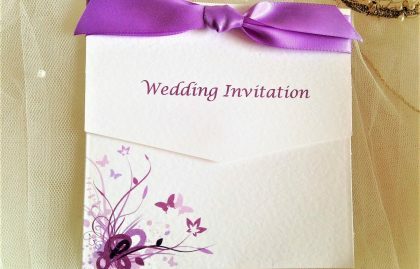 All our invitations shown below are also available as evening reception invitations. 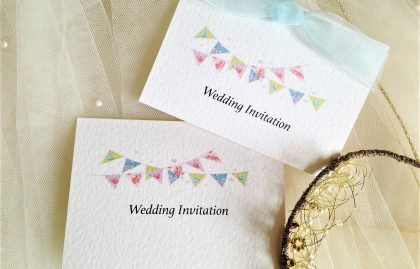 If you see a design or style you like, but would like it on one of our other styles of wedding invitation, please contact us. 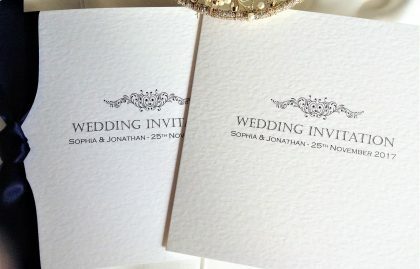 We can print whatever text you’d like on the front and inside the invitations. 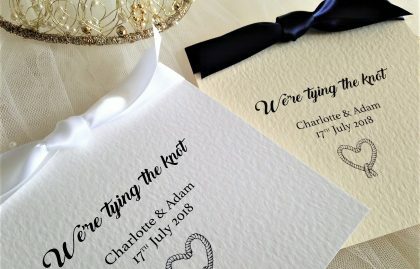 If you have your own design element or photograph, which you’d like to include on any of our wedding invitations or wedding stationery items, then please contact us by email or telephone and we can discuss. 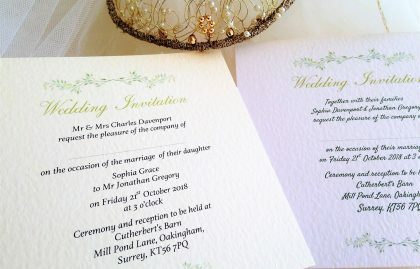 Daisy Chain Invites are a small UK family owned business who have years of experience in producing wedding invitations for all styles of wedding ceremony. 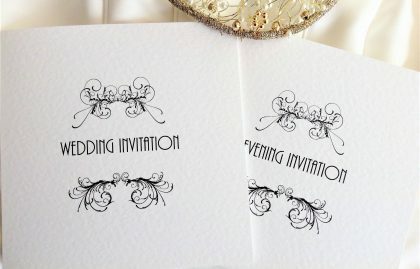 Whether you’re having an intimate wedding with just your nearest and dearest, or a larger celebration with hundreds of guests, we can supply personalised wedding invitations handmade for you. 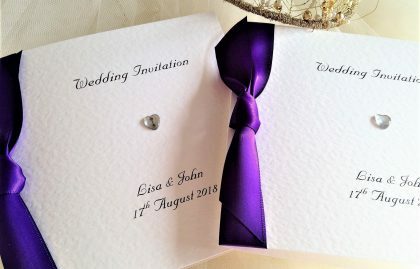 We only use the best quality materials, the heaviest thick card and quality ribbons in both satin and organza, nice and wide, to match your colour scheme. 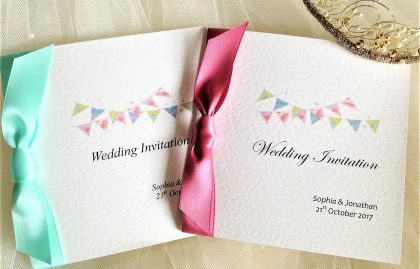 Why not dress your invitation in some bright ribbon to make opening it even more of a treat for your guests? 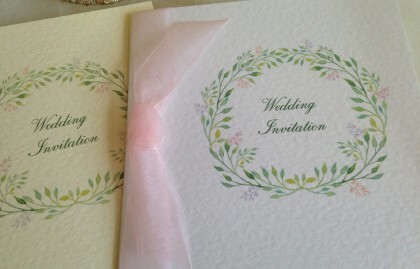 No need to make your own wedding invitations when our prices are so affordable. 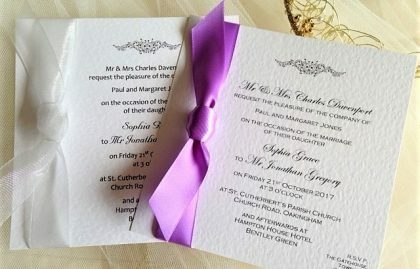 We are able to produce invitations in most languages and have also printed religious symbols for Muslim, Sikh and Hindu weddings. 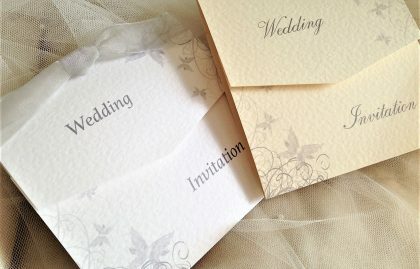 We have produced wedding invitations for Muslim, Polish, Romanian, Spanish, French, Greek, Jewish and Ghanaian weddings. Please contact us to discuss any special requirements.